A visitor attraction showcasing "boats, steam and stories" has opened its doors in the Lake District. 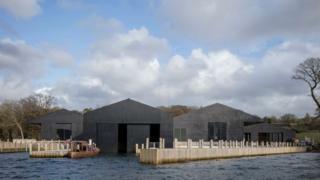 The £20m Windermere Jetty Museum replaces an older one which closed more than 10 years ago. Its seven buildings house vessels dating back 200 years, including the SL Dolly, thought to be the oldest mechanically-powered one in the world. Others include Beatrix Potter's tarn boat, in which she used to sketch, and a luxurious Victorian steam launch. Visitors will also get the chance to watch a team of skilled conservation boat builders restore vessels using traditional skills. Rhian Harris from Lakeland Arts, which runs the museum, described it as "extraordinary". He said: "[It] connects visitors with the collection, to the lake and with the wider Lake District landscape, telling the incredible stories of those to whom Windermere has been so important." Image caption Architect Carmody Groarke said the design "referenced vernacular Lake District buildings in their characteristic overhanging roof canopies"